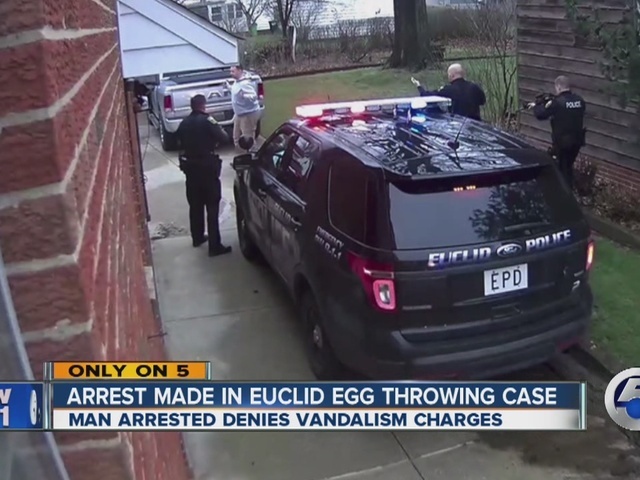 A 30-year-old Euclid, Ohio, man was arrested and charged with felony vandalism on Tuesday after police said he threw eggs and other objects at his neighbor's home for more than a year -- a case that even made national headlines. Speaking exclusively to newsnet5.com's Homa Bash, Jason Kozan adamantly denied all charges. "I guess for some reason, they couldn't get a suspect so they had to do something to calm the media," Kozan said. "Let the jury decide. I have my evidence, evidence against Euclid Police, and whatever evidence they have on me, well, that's what the jury is for." Police said the arrest was a result of a continual investigation, including a search warrant served to Kozan's home last April. A photo of SWAT members behind a shield was captured by Kozan's surveillance cameras. In 2015, Euclid homeowners on Wilmore Avenue were victimized when their home was egged over 100 times. Wednesday, police said the home was also hit with grapefruits, onions and paintballs in addition to the eggs. "There's a lot of things to be concerned about and it's not eggs hitting a house," said Euclid Lt. Mike Knack. Lt. Knack said Kozan has made previous threats to police officers, which is why the show of force was warranted. On Wednesday, according to Euclid Municipal Court, Kozan appeared in front of Judge Deborah LeBarron. It was determined he committed the vandalism between May 20, 2014 and June 26, 2015. Kozan entered no plea. LeBarron set his bond at $2,000, which he paid and was released. Police said his case will be forwarded to the Cuyahoga County Grand Jury for an indictment. Kozan has no previous criminal history.